You want to develop your own e-commerce platform. But you have, difficulties to make your choice in the various CMS (Content Management System) of e-commerce, in particular between Magento and Prestashop? This article aims to enlighten you on this subject by presenting them to you, through their main characteristics and distinctions. But before you start, you should know that the choice depends on two essential factors: expertise and budget. Depending on the rates, e-commerce platforms offer more or less attractive sales sites. Aesthetics is not the only factor that influences, there is also complexity. Depending on the user and the computer program on which the platform is based, the development speed of some modules may vary. Like PrestaShop, Magento is a technical e-commerce solution designed on open source. This is equivalent to a free download and installation. In both cases, to have an efficient shop, ergonomically and SEO. It is necessary to subscribe to additional paid features, called add-ons. These additional modules, offers interesting services in converting the visitor into a customer. Like, for example, retargeting about the abandoned basket. A professional version reserved for companies, very expensive by its extreme advanced. The Magento Go version (renamed Small Business), designed for small businesses. For less than $10 this package includes accommodation. But also with its free community version (Community Edition) a robust, community version adapted to certain companies with important ambitions. There's nothing stopping you from getting started. And if you encounter difficulties, Magento provides you with paid telephone assistance, available 7 days a week and 24 hours a day. Summary: Magento is a qualitative CMS, physically very heavy, with expensive modules. There is a major flaw, however, concerning its uneconomical interface. Unlike Magento, PrestaShop requires lower coding skills. Its interface is more intuitive and ergonomic than the previous one. Navigation will be more pleasant, both for novices and CMS experts. Its unique open source access, combined with support from a very dynamic francophone community, promotes mutual aid between amateur and experienced users. It makes him benefit from a moderately lower cost. But you still have to take into account the cost of hosting on very powerful servers. The marketing of its simplified add-ons, which are essential for back-office operations, such as invoice management and logistics services, increases its appeal. Fast data distribution and recording via high-performance servers. A Francophone community of over 800,000 members. Summary: PrestaShop is a CMS more fluid and easier to access, with for defect its natural system of referencing less powerful than its competitor. 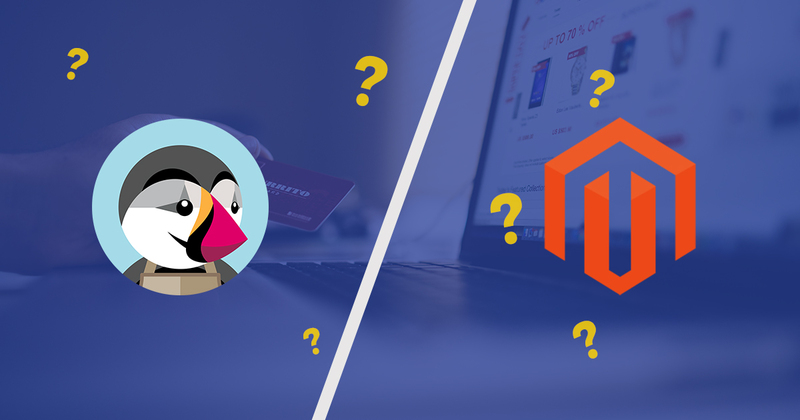 PrestaShop or Magento? You will have understood this choice depends only on the resources you have. If your company is small scale, or if you don't have the skills of an experienced developer, turn to PrestaShop. Otherwise choose Magento, in order to benefit from a perpetual freedom in the modeling of your e-commerce platform.